For as long as I’ve been an automotive enthusiast I’ve wished I had a car I could track. I’ve always had modified vehicles, but they more drivers than anything that would win a race. 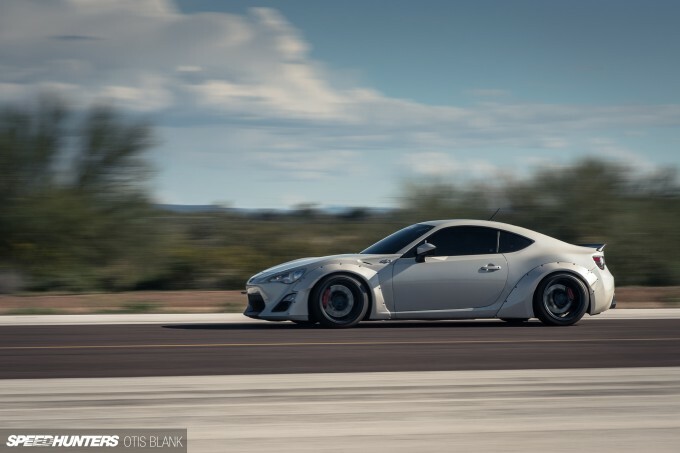 Now that I own a modified Scion FR-S, I’ve found myself falling into the boring rhythm of daily driving and telling myself I’m too busy to make it to the next autocross. But this past weekend I finally snapped out of it. Now, I’ve lapped my car at Bondurant a bit, but that was just messing around because I could. This time I would be donning my new Impact helmet and strapping in for some real timed passes on a stretch of the Gila Bend Airport at Omega Motorsports’ No Fly Zone half mile race. To recap, my car is supercharged by Innovate, but still on stock internals. 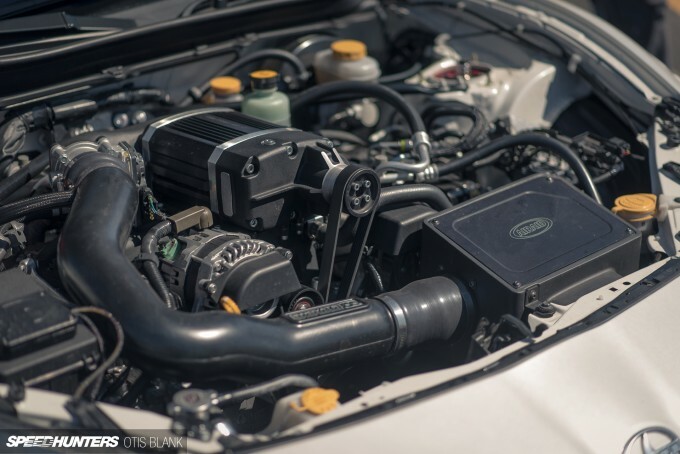 With the addition of an Airaid intake, Delicious flex fuel tune and a hand-built PPE mid-pipe and cat-back, the car makes around 300 horsepower at the wheels, provided I dump some E85 in the tank. That’s double the stock output with a nice straight torque curve, so I’m quite happy with the result. Let’s back up though, because you know my project stories are always about wrenching or fabricating! 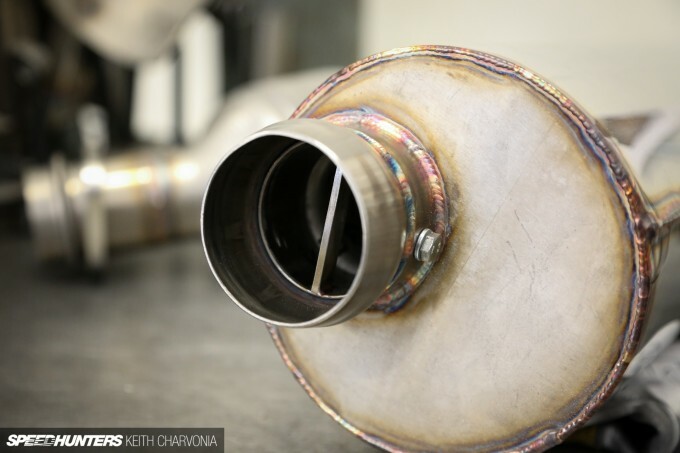 This time I stopped by PPE, a local fabrication and engineering shop that builds really nice headers and exhaust components. 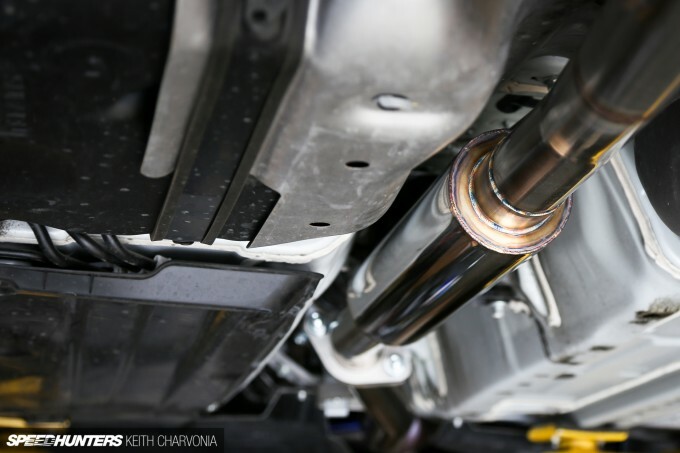 In fact, they built this muffler specifically for my car, from scratch. 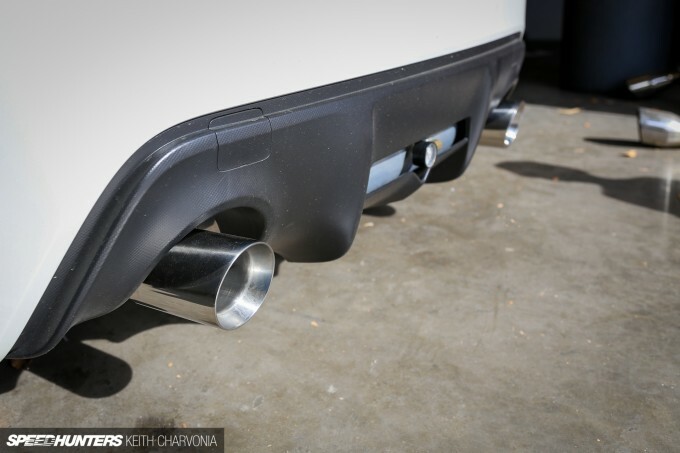 I had discussed the quandary with my current cat-back with PPE’s owner, Paul Prentis, and he offered the awesome solution of a custom-built, dual-mode muffler. One side has a tuned baffle that can be inserted or removed depending on the sound level you want, so next time I drive my car to California I won’t be tempted to install the stock exhaust for a nice quiet ride. Yes, I’ve really done that! 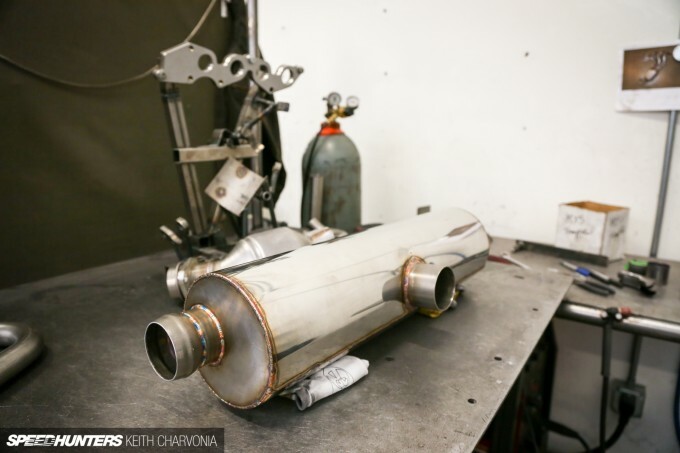 Since the muffler is pretty small due to space constraints, he also installed a high-flow catalytic converter and a custom-made resonator to keep the sound to a nice level. When I came to pick the car up PPE still had it in the air so I could check out their work. When’s the last time you had a shop ask for your approval like this? Obviously I was impressed and couldn’t wait to hear it. 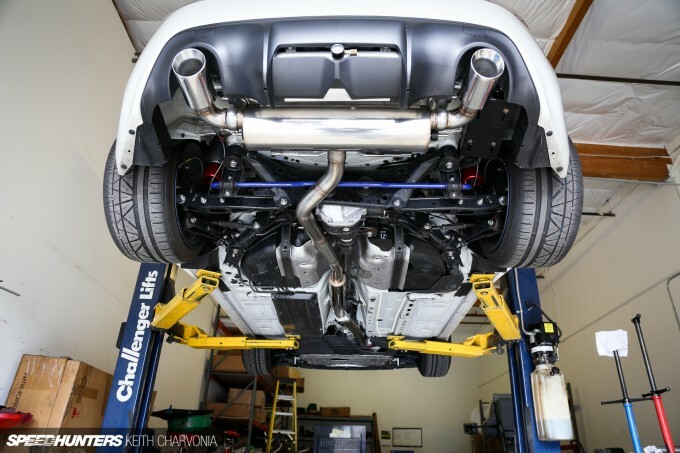 The new, quieter tone is much more suited to my tastes, and I thought it was pretty cool that after a short conversation Paul knew exactly what to do to build an exhaust that would match the sound I was hoping for. 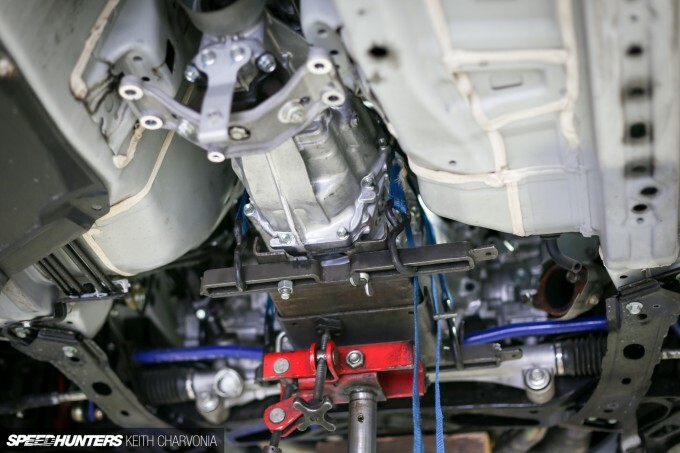 In my last project update I detailed the testing we did on the dyno to optimize power output, and mentioned that I was now up against the holding capacity of the stock clutch. 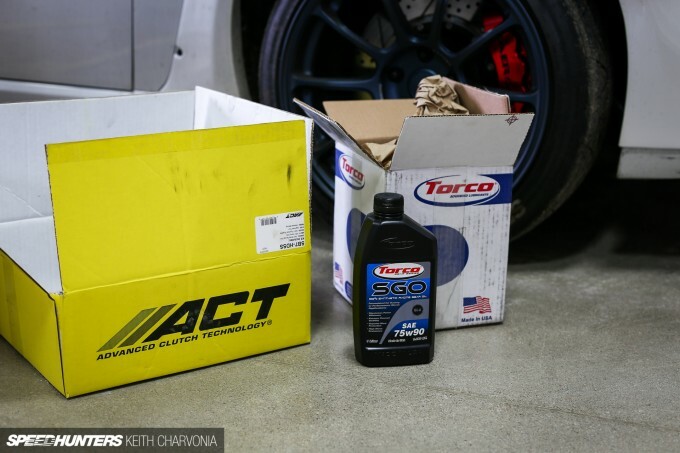 In short order I had an ACT SB7-HDSS clutch on the way, along with some Torco synthetic gear oil to cure the infamous second gear ‘scratch’ that these cars suffer from. I do have a mid-rise lift in my two-car garage at home, but a clutch installation is no fun when you’re crawling around on the ground. Fortunately my friend Phil welcomed me into his massive home workshop when he heard about the upcoming clutch job. This photo sums up Phil pretty well. 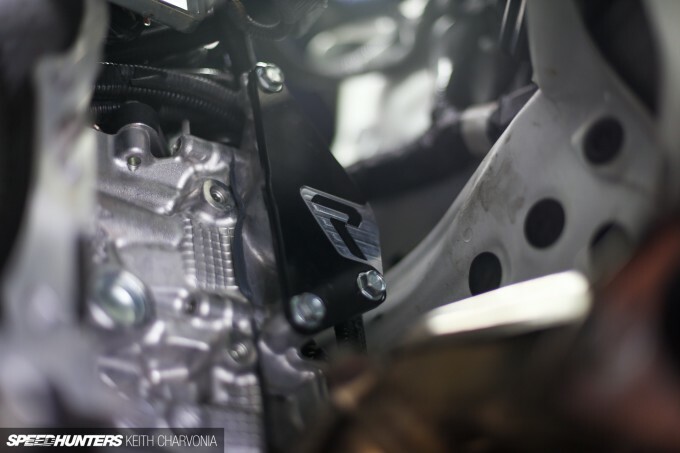 He’s a commercial jet mechanic by day and an expert Corvette restorer by night. Every time I swing a wrench with this guy I learn something new. With the car in the air we first drained out the stock transmission oil. Next we moved the transmission jack into position and strapped the transmission into place. These are the kinds of pro tools that Phil has in his shop to make jobs go much faster. Within 30 minutes we had the transmission removed. It sure beat wrestling the gearbox onto the ground with brute force. With the trans out of the way I wanted to tackle this oil leak that had developed. 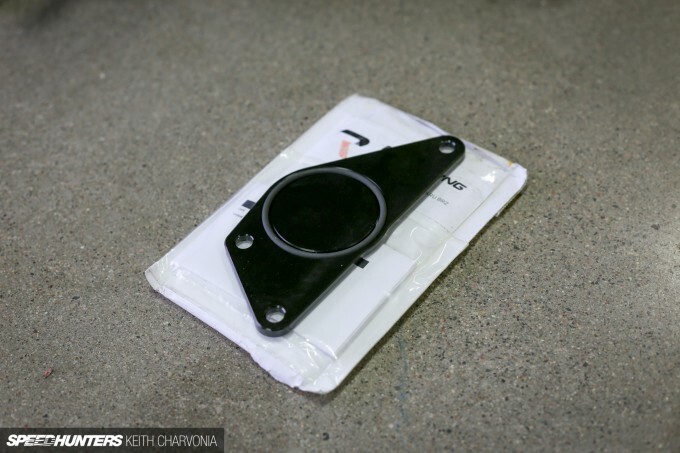 There is some speculation that forced induction kits are causing this cover to leak oil, but I think owners of stock cars have had it happen too. Either way, I was going to solve the problem with this CNC machined piece from Raceseng. 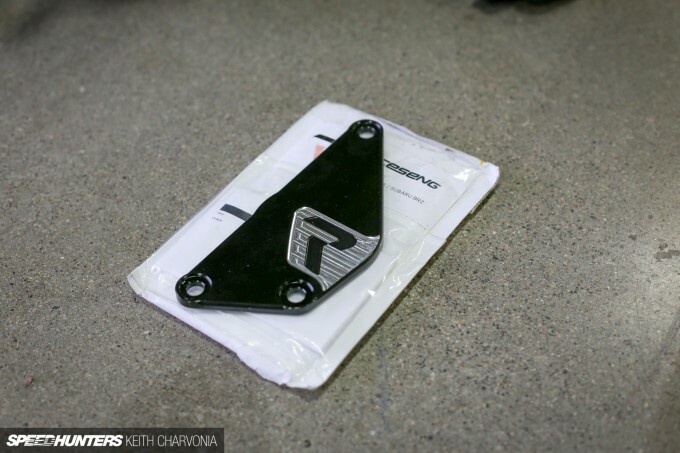 Rather than using RTV to form the seal, this aluminum plate holds an o-ring for a much more durable seal. Being the perfectionist that he is, Phil jumped in and cleaned up the mating surface. 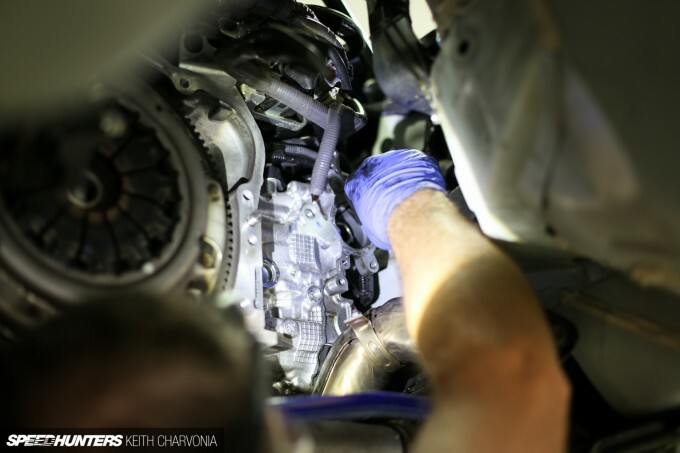 This is a pretty easy part to install from the top side of the engine bay, but with the transmission out we were looking right at it, so it seemed a good time to swap it in. With the oil leak cured, we moved on with the clutch installation. 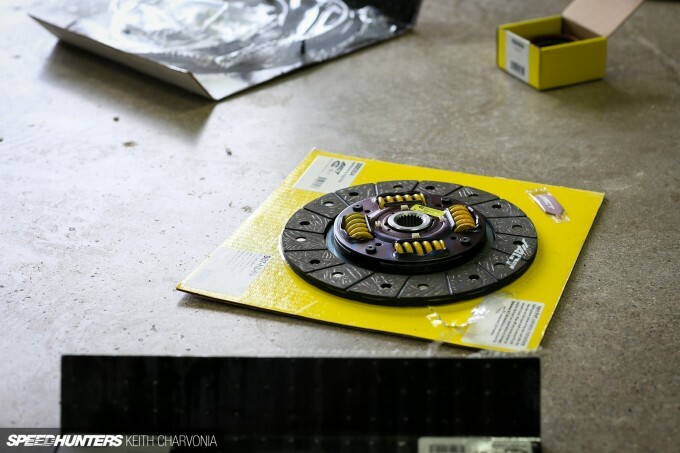 ACT includes a new throwout bearing with the clutch kit, which is always good to replace while you’re in there. 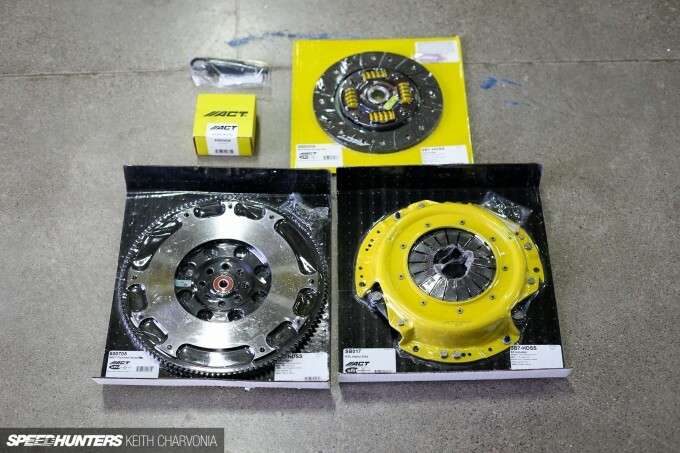 The kit also came with an 11.8lb lightened steel flywheel – a very nice reduction from the stock 20lb unit, but still heavy enough to damper the boxer engine’s harmonics. 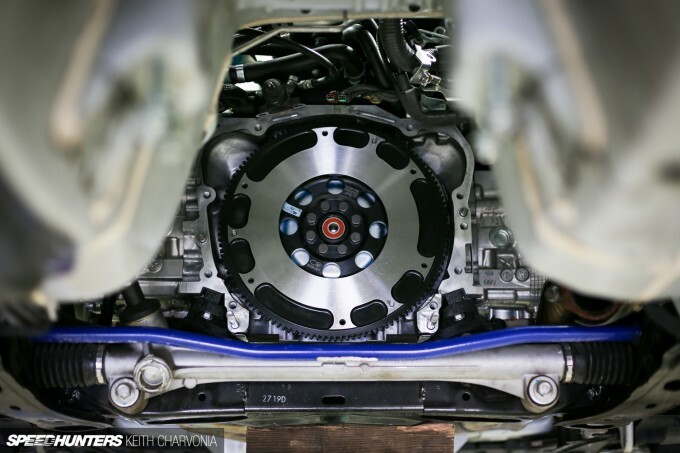 With the flywheel torqued down we secured the clutch disc with the included alignment tool. 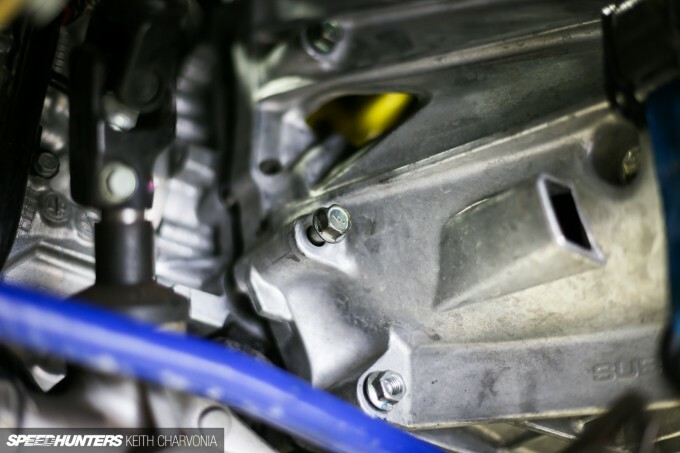 I chose the least aggressive offering from ACT because while it was right at the limit of what my engine is currently making, I don’t want my modifications to spiral out of control and create a car that I no longer enjoy driving. I was very pleased to find that the increased clamping force did not come with the penalty of a ridiculously heavy pedal. With everything torqued, we lifted the transmission back in place on the jack. 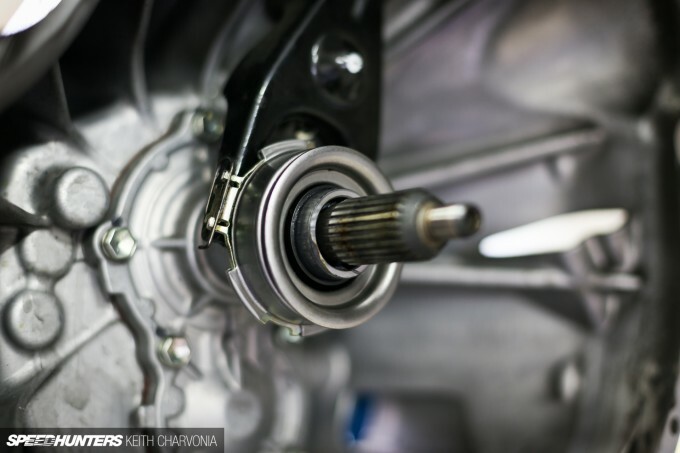 Even with an alignment tool it’s sometimes tricky to get the input shaft to engage the clutch disc and the pilot bearing at the same time. 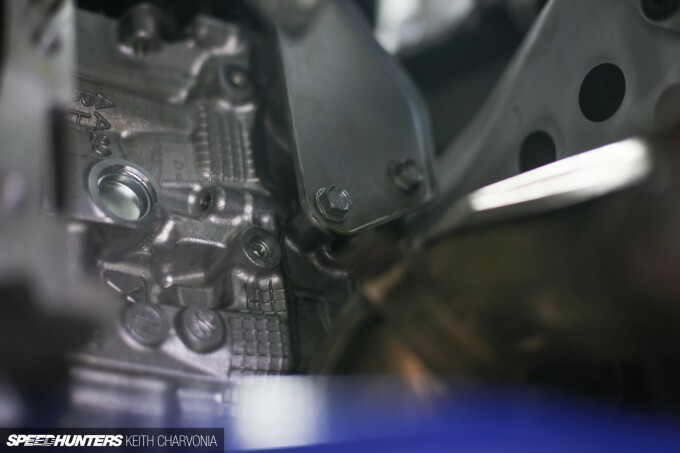 We used the bellhousing bolts as a guide, then wiggled and shook the transmission until it popped into place. Working in Phil’s shop turned this into an easy half-day task, and before long I was test driving the car back to my house. I got on it a bit and was actually surprised at how quickly the engine spun up with the lightened flywheel. I still needed to take it easy for a few hundred miles to let everything break in properly though. With the clutch sorted I was much more confident taking my car to the No Fly Zone half-mile racing event. Even though I had one of the lowest horsepower cars there, I knew I would have fun and was looking forward to seeing what my car could do within the confines of a safe, controlled environment. One of the great things about working in the aftermarket is getting to represent your company at events. This time Airaid was a sponsor, so we all brought out our modded cars to see what they could do. It’s always fun to race the guy who sits in your office too. I do think I freaked some people out when I dumped my car in front of the Airaid booth, but they were about to see that airbags aren’t just for parking. Before we left I stashed two jugs of E85 in the Airaid trailer. I tested the content so I knew how much ethanol I was actually running, then filled it up. Fortunately this was a good batch and measured at exactly 85 per cent. My friend hopped in for the first couple of runs and we exited the pit area. Things were running very smoothly and quickly, with just a 30-second lag between races. The more ambitious drivers got in up to 40 passes in one day. This is the burnout area, but I didn’t see any reason to warm up my street tires so I rolled right through. My first run was a pathetic 120mph (193km/h) pass. The idea behind roll racing is that you pace the other car until the first set of cones and then start from 40mph (64km/h), but I had a hard time hitting that speed exactly at the marker. After a couple more runs with my friend helping me time the cones I had it down, and was ready to challenge someone to a race. While comparing notes within the Airaid camp, we noticed that our graphic designer’s new Hemi Challenger was running pretty close to my car. Even thought his engine is nearly triple the size of mine, his car is pretty stock and heavy too. I gave him a run for his money with my little 2.0-liter boxer engine. It was good to finally know where my car stood compared to another car I might line up against. In my quest to improve my top speed, I started with weight reduction by kicking out the passenger. Next I emptied my trunk, and got up to 128mph (206km/h). At the last event we brought out Airaid’s 2015 5.0-liter Mustang and it ran 132mph (212km/h), so I had that number in mind to beat. I noticed the car started losing speed after a few passes, so I chose to pull in and let it cool off before making any more attempts. I was getting close to 130mph (209km/h) now, but wanted that little extra. 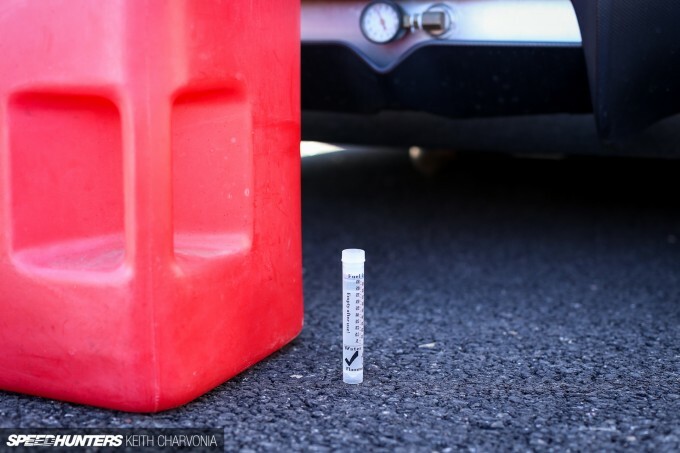 I figured the first 5-gallon can of E85 was blended with a gallon or two of 91 octane, so I dumped in the second jug hoping the mix might be a little more loaded with ethanol. After letting the car cool down I took it out and ran the 132 I was looking for, so I called it a day. It was nice to know that my car could hang with the big V8 Challengers and Mustangs – especially in this environment where I would focus on my driving instead of traffic or the police. If you ever get a chance to race in an event like this, I would definitely encourage it! I still can't get over how much I dig that tank install! A very creative and functional. The car is looking great with those Rays Keith! mad1723 Yep. I even tried to reseal the stock plate once and it leaked again right away. Raceseng to the rescue! AirLift_Lucas Thanks! I actually ordered a new gauge for it today. It was hard to find something that would fit just right, but I think I finally found it. 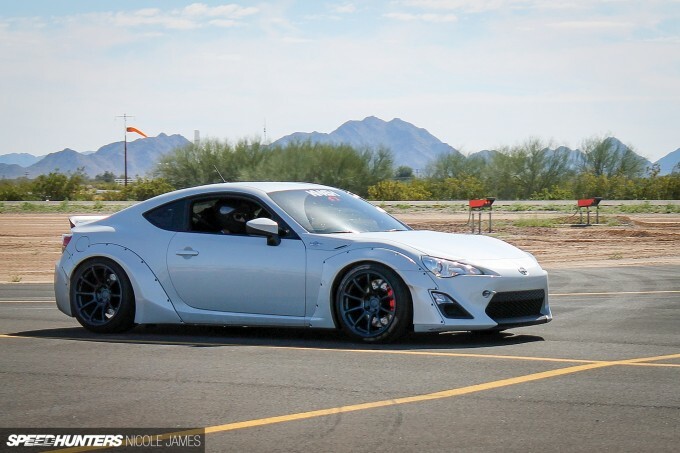 Is there any other cars that are running the KM4SH kit besides the black one in japan, the scion tuner challenge car, and your personal car? 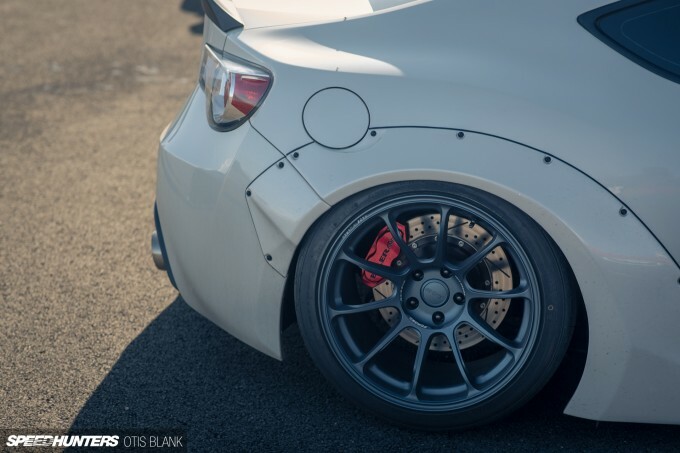 I haven't seen any other frs/brz's with it on, which is a shame because it's easily my favorite widebody kit for the toyobaru twins. is it stupid to ask why you wouldn't just dump the air lift all together for all out handling/weight advantages? 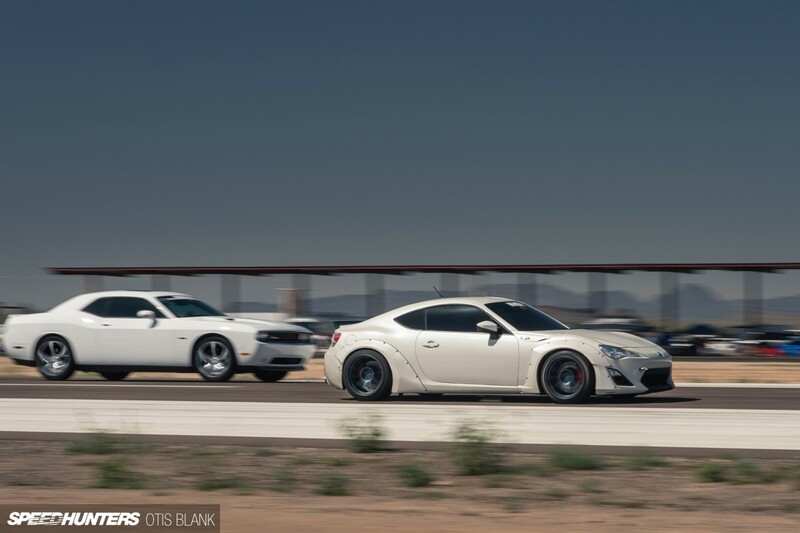 Its good to know there are also 86/FR-S/BRZs for the "straightaways". loslogo x2. KW should be able to sort you out with something fun, right? 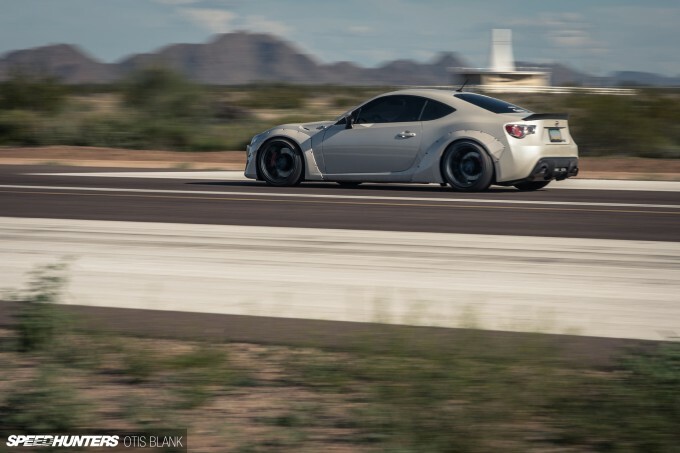 This is awesome, I swear every day I am closer to biting the bullet and going for an FR-S/BRZ. Seems like an extremely fun car with tons of potential. It's great to see how you're going about the modifications. Thanks for all the info! 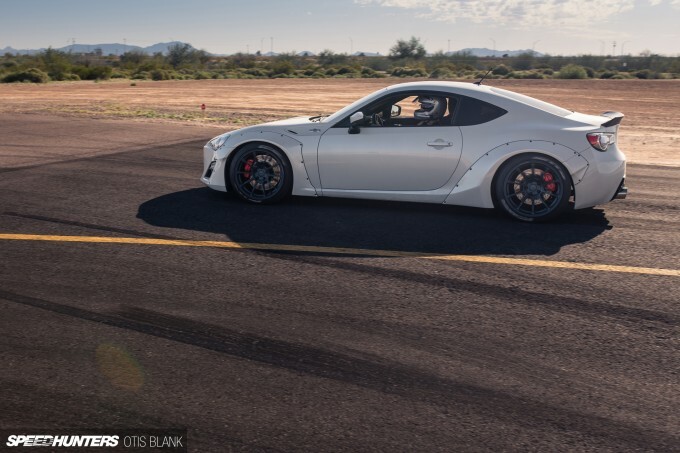 Great read, I'm looking to purchase an 86 sometime in the future and it's great reading about upgrades and track use. Keep it coming! jcali Thanks! 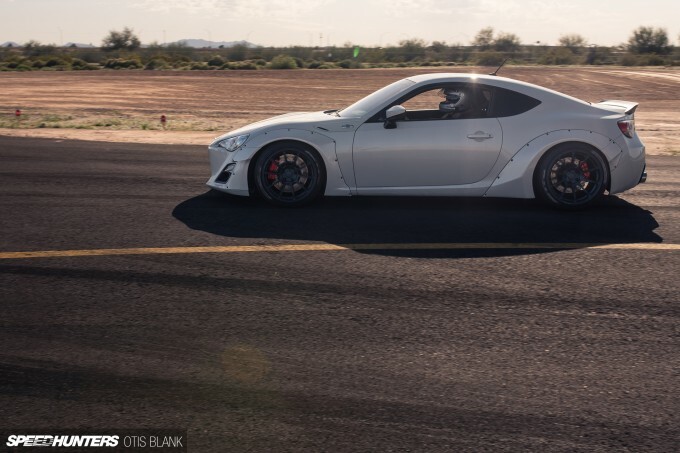 You'll love owning an FR-S too. matthewyaa Do it! I love mine. Miketejero It's not exactly a dragster but it was good to see how my FR-S stacked up against the V-8 cars. mrwicksy loslogo I've actually had KW V3s on this car too. 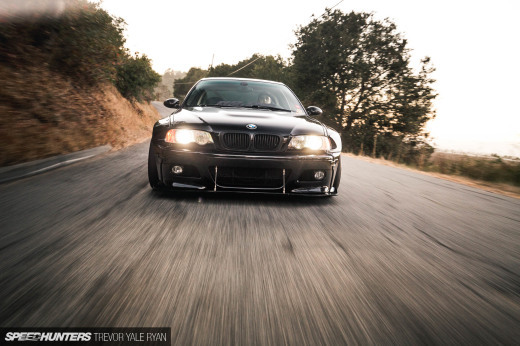 They rode and handled great, but I wanted to get the car lower with the KM4SH kit. I have nothing but good things to say about both systems. There are ten or so kits out there now. Do you mean lower the car all the way? It would ride really bad and be uncontrollable. No up-travel and alignment would be way out of spec. 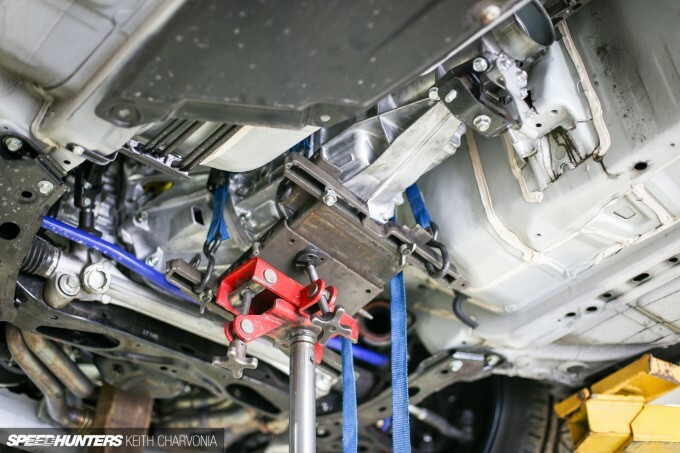 Also the Air Lift struts are actually lighter than typical coilovers so there is less unsprung weight with this setup. Once you add a compressor and tank you're about equal to the overall weight of coilovers. The car is looking great with those Rays Keith! juegoskizi Thanks! I'm really liking them too. No5ki crispykrem3 I love this car. Congrats on a nice KM4SH build! loslogo Check this video of our out bro. 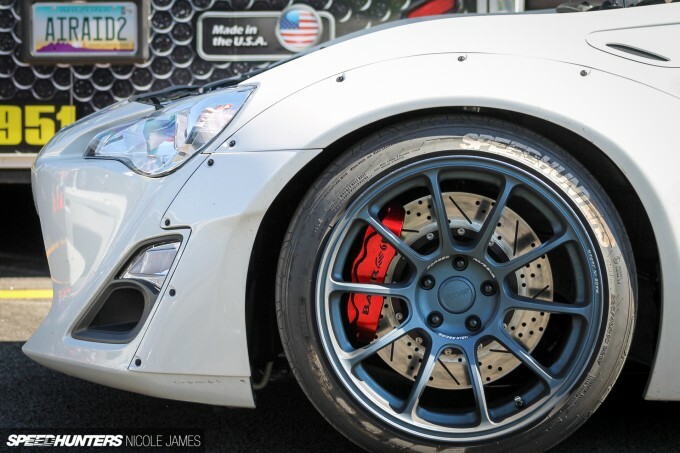 We are not saying bags are the end-all-be-all, but merely that they can hang with other top of the line coilovers. Totally understand the feeling of wanting to know how you measure up to other brands even if they are the superior in certain aspects. I wanted nothing more than to see how a GEN 5 Camaro stacked up against my 2011 GT and one night I finally got my answer. It's not so much a superiority complex you just want to know that "what if" factor, had Honda not rid all the local lots back in 2011 for all the 2012 style's i'd probably be riding around town in a Civic Si Sedan instead of a Mustang. 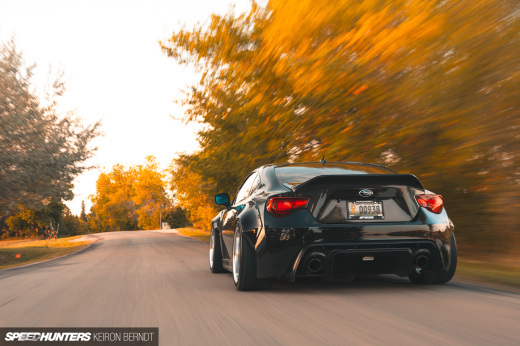 To each their own and I dig the look and performance of your car KeithCharvonia keep up the writing and the mods on your car. acollite Hey thanks! Time to order that Raceseng plate huh? 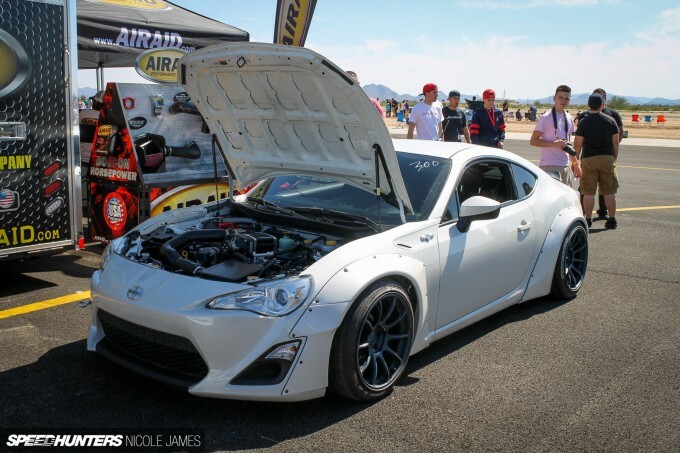 300hp combined with JDM lightweight chassis equals American stock domestics! Interesting about the leak. 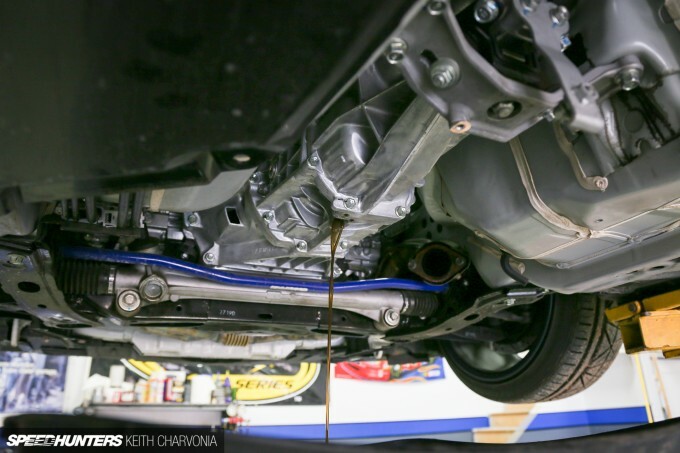 My stock-engine '13 FR-S (7/12 build date) developed that exact same leak; I just recently had it fixed under warranty.